Maintain 360° view of your customer touchpoints from offline and in-store interactions to mobile apps and CRM. Using several vendors keeps meaningful consumer data in silos. With Dynamic Yield, all aspects are aligned enabling the richest data set in the industry. Go live in days to personalize more experiences in less time, without dependency on developers. Discover high-impact audiences using an advanced segmentation engine. 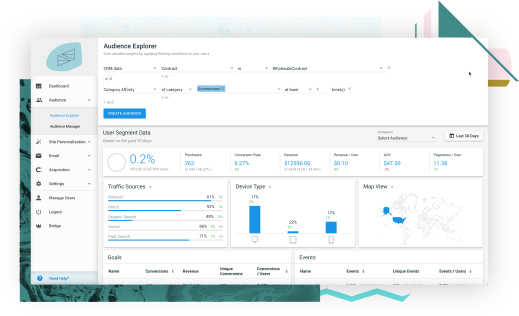 Build audiences according to purchase history, product affinity, customer lifetime value, weather forecast, CRM data, geo and more. Discover, target and personalize experiences for different sets of customer segments and use machine learning algorithms to match between the right experience and the right audience segment. Recommend only the right products throughout the entire customer journey and let Dynamic Yield’s decisioning engine find the most effective strategies to maximize revenue. Let machine learning maximize uplifts by delivering the most relevant shopping experience, tailored to each individual user, even if user behavior changes over time. Engage shoppers with product discovery widgets, exit-intent popups, welcome overlays, social-proof and product demand notifications, email capture messages, and more. Extend personalization beyond the web. Win back customers with triggered abandoned cart emails and re-engage app abandoners with personalized push notifications. Effectively reduce abandonments at every step of the customer journey and navigating the three phases of shopping cart abandonment to recapture valuable revenue. Discover how a wide variety of personalization use cases pay off across a plethora of KPIs.